Bar-Yosef, O., 1981, The "Pre-PotteryNeolithic"period in the Southern Levant. In Préhistoire du Levant, edited by J. Cauvin and P. Sanlaville, pp. 551-570. CNRS, Paris. 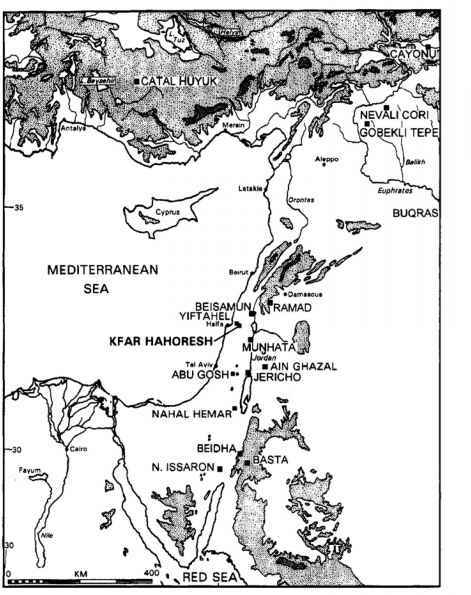 Bar-Yosef, O., 1991, The Early Neolithic of the Levant: Recent Advances. The Review ofAr-chaeology 12(2): 1-18. Bar-Yosef,O.,and Belfer-Cohen A,, 1989,The Levantine "PPNB"Interaction Sphere. In People and Culture in Change: Proceedings of the Second Symposium of Upper Paleolithic, Mesolithic, and Neolithic Populations of Europe and the Mediterranean Basin, edited by I. Hershkovitz, pp. 59-72. British Archaeology Review, International Series 508. BAR, Oxford. Bar-Yosef, O., and Kislev, M., 1989, Early Farming Communities in the Jordan Valley. In Foraging and Farming: The Evolution of Plant Exploitation, edited by D. R. Harris and G. C. Hillman, pp, 632-640.Hyman and Unwin, London. Bar-Yosef, O., and Meadow, R., 1995, The Origins of Agriculture in the Near East. In Last Hunters-FirstFarmers: New Perspectives on the Prehistoric Transition to Agriculture, edited by T. D. Price and A. G. Gebauer, pp. 39-94. School for American Research, Santa Fe, New Mexico. Asia. Journal of World History 1(2): 278-310. Cauvin, J,, 1987, Chronologie Relative et Absolue dans le Néolithique du Levant Nord et d'AnatolieEntre 10,000-8,000B.P.In Chronologiesin theNearEast, edited by O. Aurence, F. Evin, and F. Hours, pp. 325-342. British Archaeology Review, International Series 508. BAR, Oxford. Cauvin, J., 1994, Naissance des Divinités, Naissance de l'agriculture. CNRS, Paris. Crowfoot-Payne, J., 1976, The Terminology of the Aceramic Neolithic Period in the Levant. In Terminology of Prehistory of the Near East, edited by F. Wendorf, pp. 131-137. UISPP Congress IX, Nice. Crowfoot-Payne, J., 1983, The Flint Industries of Jericho. In Excavations at Jericho, Vol. V, edited by K. M. Kenyon and T. A. Holland, pp. 622-759. The British School of Archaeology in Jerusalem, London. Garfinkel, Y., and Nadel, D., 1989, The Sultanian Flint Assemblage from Gesher and Its Implications for Recognizing Early Neolithic Entities in the Levant. Paléorient 15(2): 139152. Gopher,A,, 1994, Arrowheads ofhe Neolithic Levant. American Schools of Oriental Research: Dissertation Series, Volume 10. Eisenbrauns, Winona Lake, Indiana. Hauptmann, H., 1993, Ein Kultgebäude in Nevali Çori. In Between the Rivers and over the Mountains, edited by M. Frangipane, H. Hauptmann, M. Liverani, P. Matthiae, and M. Mellink, pp. 37-69. Dipartimento di Scienze Storiche Archeologiche e Anthropologiche dell'Antichità, Università di Roma "La Sapienza," Rome. Hayden, B., 1995, A New Overview of Domestication. In Last Hunters-First Farmers: New Perspectives on the Transition to Agriculture, edited by T. Douglas Price and A. B. Gebauer, pp. 273-300. Schools of American Research Press, Santa Fe, New Mexico. Hillman, G. C., and Davis M., S., 1990, Measured Domestication Rates in Wild Wheats and Barley under Primative Cultivation, and Their Archaeological Implications. Journal of World Prehistory 4(2): 157-222. Hodder, I., (ed. ), 1996, On the Surface: Çatalhôyûk 1993-1995. McDonald Institute of Archaeological Research and the British Institute of Archaeology at Ankara, Cambridge. Kozlowski, S. K., 1989,Nemrik 9, A PPN Neolithic Site in Northern Iraq. Paléorient 15(1): 2531. Kuijt, I., 1997a, Interpretation, Data and the Khiamian of the South-central Levant. Neo-Lithics 3:3-6. Kuijt, I., 1997b, Trying to Fit Round Houses into Square Holes: Re-examining the Timing of the South-central Levantine Pre-Pottery Neolithic A and Pre-Pottery Neolithic B Cultural Transition. In ThePrehistoy ofJordanll: Perspectivesfrom 1997, edited by H. G. Gebel, Z. Kafafi, and G. O. Rollefson, pp. 193-202. Ex Oriente, Berlin. McCorriston, J., and Hole F., 1991,The Ecology of Seasonal Stress and the Origins of Agriculture in the Near East. American Anthropologist 93(1): 46-94. Moore, A,, 1985, The Development in Neolithic Societies in the Near East. In Advances in WorldArchaeology, edited by F. Wendorf and A. E. Close, pp, 1-69. Academic Press, New York. Nadel, D., 1990, The Khiamian as a Case of Sultanian Intersite Variability. Mitekufat Haeven 23: 86-99. Nissen, H.J., 1993, The PPNC, the Sheep and the "Hiatus Palestinien." Paléorient 19(1): 177183. Perrot, J., 1993, Commentaires. Paléorient 19(1): 175-177. Price, T. D., 1995, Social Inequality at the Origins of Agriculture. In Foundations of Social Inequality, edited by T. D. Price and G. M. Feinman, pp. 129-151.Plenum, New York. Rollefson, G. O., 1989, The Late Aceramic Neolithic of the Levant: A Synthesis. Paléorient 15(1): 168-173. Rollefson, G. O., and Köhler-Rollefson, I., 1993a, PPNC Adaptations in the First Half of the 6th Millennium B. C. Paléorient 19(1>): 33-42. Rollefson, G. O., and Köhler-Rollefson, I., 1993b, Reply to Comments by Hans Nissen and Jean Perrot. Paléorient 19(1): 183-185. Eastern Anatolia: Some Preliminary Observations Concerning Material Culture. Anatolica 18 1-18. Schmidt, K., 1996, The Urfa-Project 1996. Neo-Lithics 2: 2-3. Northern Iraq. Paleorient 15(1): 19-24. Winterhalder, B., 1981, Optimal Foraging Strategies and Hunter-Gatherer Research in Anthropology: Theory and Models. In Hunter-Gatherer Foraging Stategies, edited by B. Winterhalder and E. A. Smith, pp, 13-35.University of Chicago Press, Chicago, Illinois.